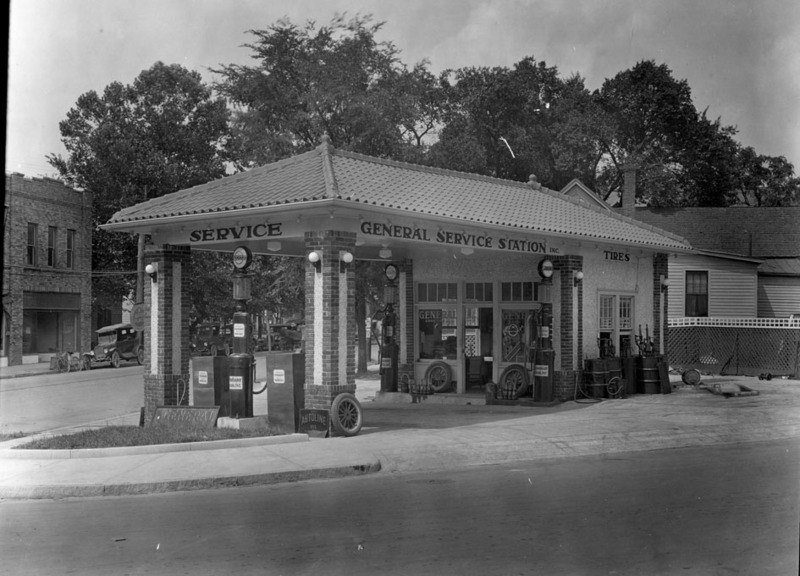 I'm struck by how much more pleasant the street scene looks in the late 1920's picture (the one with the service station). First, the street is narrower, so you don't have this vast Sahara of asphalt. Second, look at all the trees! Where did they go? Did the Redevelopment Commission kill them and then the buildings? By the way, tree killing is what originally led to the formation of the Trinity Park Neighborhood Association back in 1972 or 1973. People woke up one morning to find the city cutting down the oak trees on Trinity Avenue. (That's why there are none on Trinity between Buchanan and Watts). They managed to get it stopped and started an organization to try to prevent it in the future. Why has this city government always had an urge to tear down the wrong things? "Herbicide and urbicide" as a friend of mine called it at the time. If only they would tear down City Hall, the Jail, a few parking decks, and, of course, Ecrasez la loop! Sorry, I can't stop talking. I meant to ask: do you know who's behind "The Wesley at Mangum Place" just up the street from these buildings? It's in the MLS, and there's a sign at 524 N. Mangum, but I can't quite figure out if this a is phantom project ala Franklin Wittenberg, or something that will actually happen. I also can't quite figure out how the project will fit on the property. 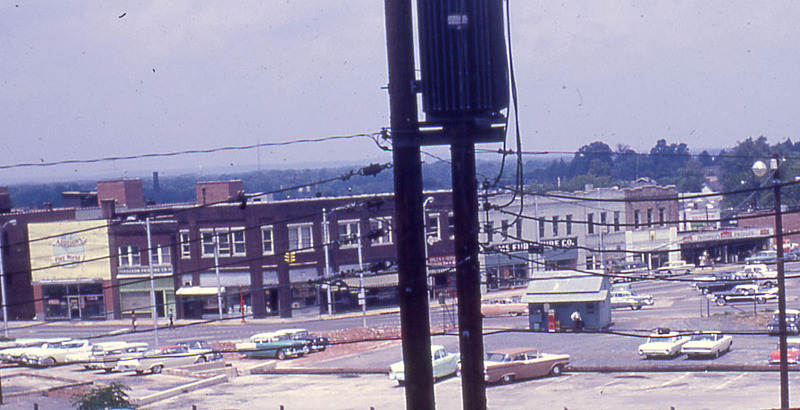 At the point that picture was taken, these buildings and the gas station were the edge of the commercial area - there was residential neighborhood extending north and east from that point. Some of the trees came down earlier, as the remainder of the block and the area around Morgan transitioned to commercial. But the residential area just to the north and east of here remained fairly residential until urban renewal, followed by additional demolition after suburban flight, etc. Good info on the TPNA - I didn't know that was the impetus. The power company is still hoping to do 'em in piecemeal, it seems. Herbicide and Urbicide - I like it. I perpetually ask myself the same question about city government. Ecrasez les imbeciles! The website (www.wesleyatmangum.com) says "Vista Development Corporation", which I've never heard of. However, Core Construction of Durham owns the site. They also have purchased a large parcel from the city located half a block away (the 600 block of mangum, between Hunt and Broadway). I posted about this site awhile ago. Hard to know the layout of the building from what's shown, but it does appear to be a tight fit, given the floorplans and only 57' of street frontage. 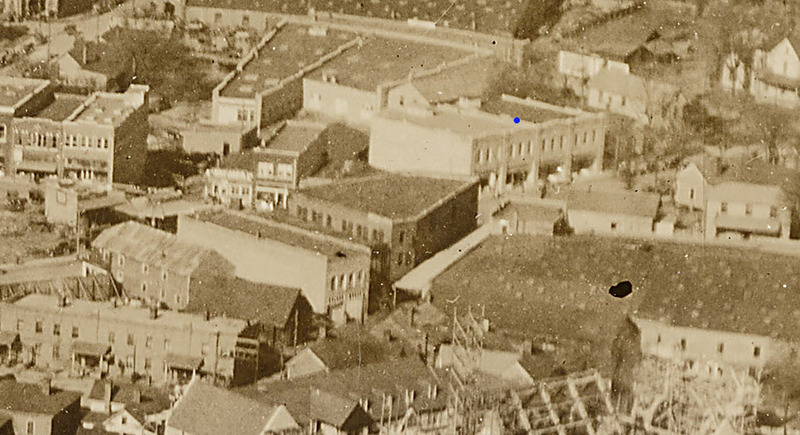 A view of part of the building (413 N. Mangum) looking northwest from East Chapel Hill St., late 1920s. 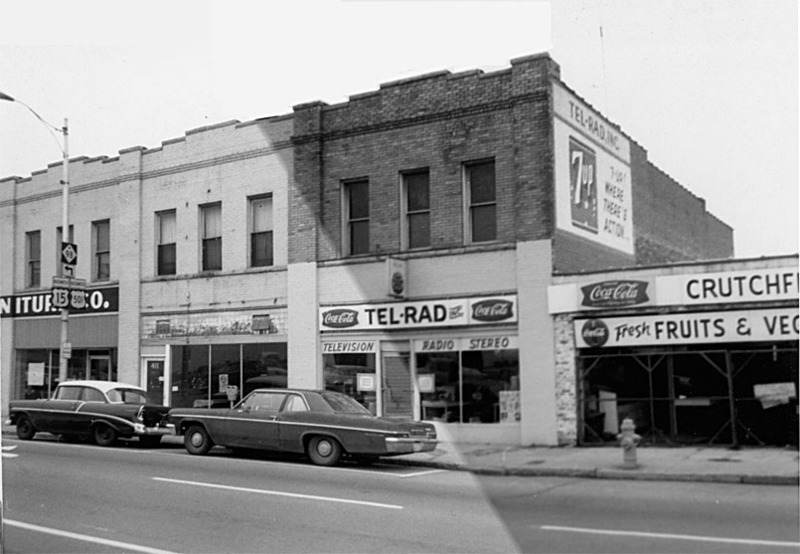 By the 1960s, 407-409 was occupied by the Home Furniture Co., and 413 by "Tel-Rad". The occupant of 411 is unknown. Looking west-southwest at 409-413 (407 is out of frame to the left). Below, a view of all 4 sections of the building, 1961. 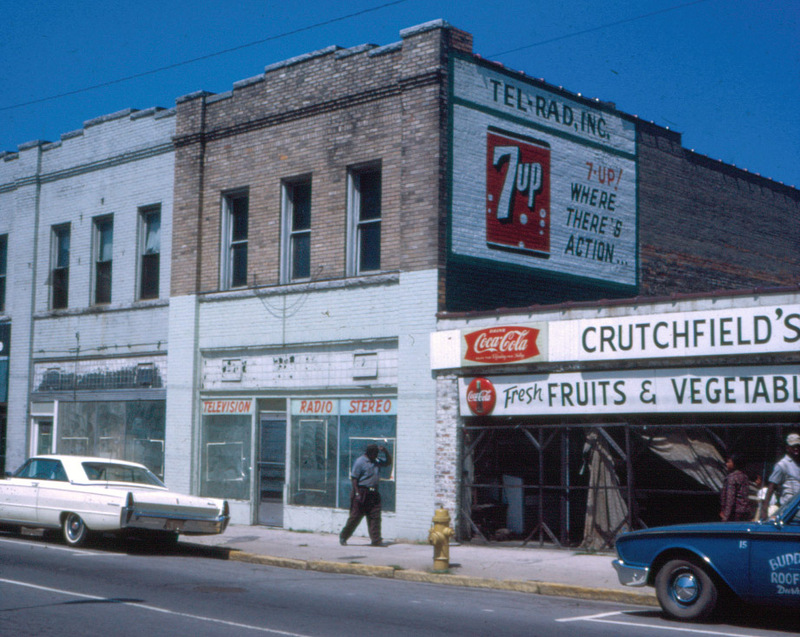 When urban renewal came, it took half of this building, demolishing 411-413 and leaving 407-409. The mostly demolished 411-413, 1968. Looking south. The demolished portion of the building was turned into surface parking. The Home Furniture Company remained the occupant of the surviving half of the building for a number of years. The building was renovated in 2006-2007 by Center Studio Architecture for residential and office space. Rear of the building, 2011. Sorry, I can't stop talking.